“It’s reorganizing the clinic. It’s a lot of paperwork and a lot of education and developing those relationships with the patients, the community, the community providers, the pharmacy so they know who I am and that I’m permanent,” Mattoni said. Mattoni is seeing up to 16 patients a day, but her schedule can vary. “Some days are full, some days aren’t full. Some days we’re available for the walk-in who wants an appointment,” Mattoni said. Mattoni provides general primary care. She’s certified in family practice and concussion care. She does annual checkups, childrens’ physicals and well-woman exams. 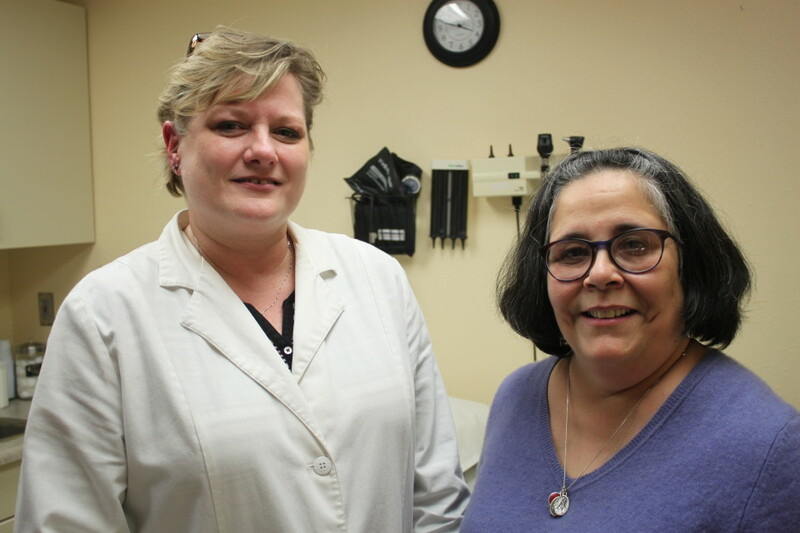 Front Street Clinic has traditionally served the homeless population. Last year, it expanded to include all low-income patients who have trouble accessing health care. There’s a sliding scale fee schedule, and a case manager can help patients sign up for Medicaid. Serving the homeless population is still a primary focus and Mattoni finds the work gratifying. “They’re kind of like the forgotten part of society and I treat everybody like they’re my family. It doesn’t matter who you are. We’re all human. We all have the same needs and that respect goes a long way,” Mattoni said. Mattoni moved to Juneau from Cleveland where she used to work in the emergency room. She encountered people who were homeless there, but she says working at Front Street is very different. “This is family practice. This is not only managing their conditions, but it’s managing chronic conditions for a long period of time. In the emergency room, you would just see them for one episodic visit. Here, I’m actually following them and following the progression of their medical care,” Mattoni said. Mattoni is the health center’s only provider. As Front Street was transitioning from being under SEARCH to becoming its own nonprofit, it discontinued behavioral health and dental services because of budget constraints. But the nonprofit recently received a federal grant of $220,000 and will soon recruit for a behavioral health specialist and another case manager. Dental services are still not in the near future. Board president Dr. Carl Heine said the clinic been outsourcing management services to Wrangell-based Alaska Island Community Services. The board is exploring the idea of completely turning the clinic over to the health care organization. “Our main concern is that the clinic continues to exist and operate and continues to meet its mission of serving the homeless and the underserved with quality medical care. We’re not necessarily, as a board, concerned that we are the ones running it,” Heine said. Heine said the new funding and its main federal grant of $385,000 are both renewable and will hopefully keep the clinic sustainable. The long-term plan is to locate the Front Street Community Health Center inside the Housing First facility to be built in Lemon Creek.